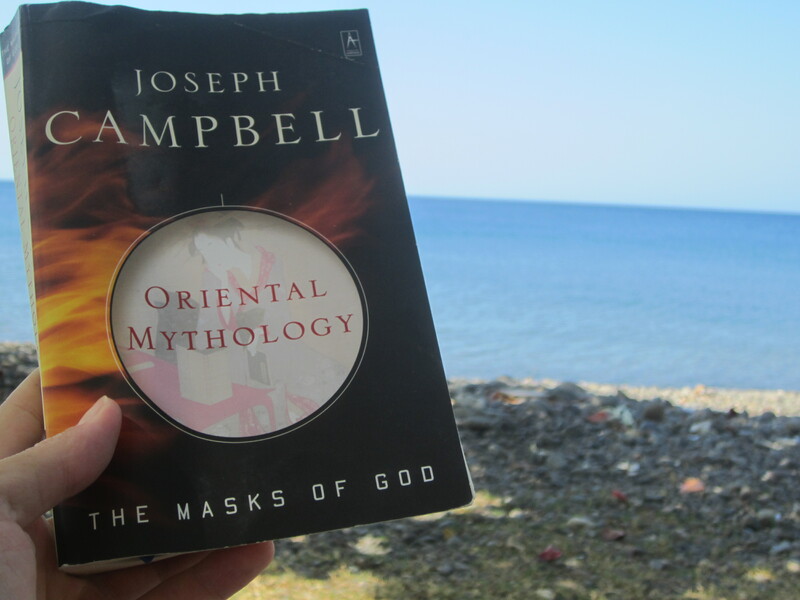 The Masks of God: Volume II, Oriental Mythology (1962) by Joseph Campbell is again one of those marathons of the mind. 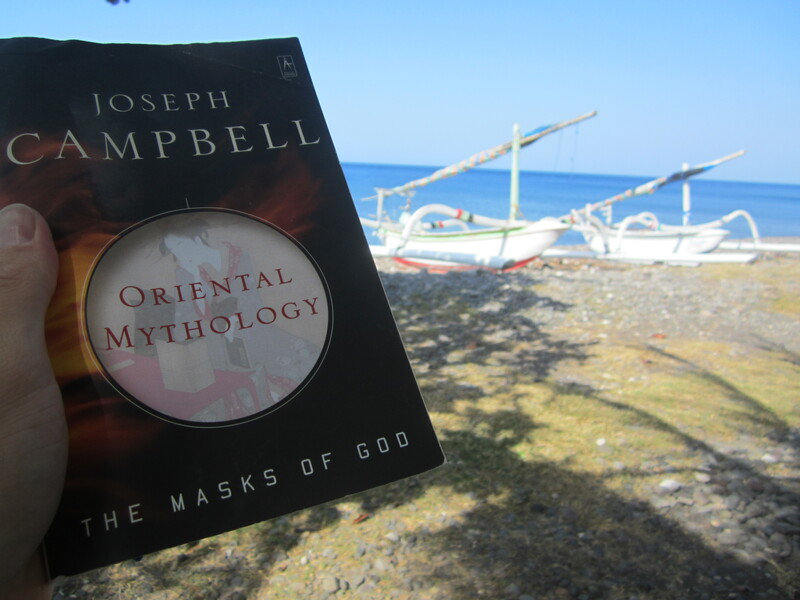 The Masks of God: Volume II, Oriental Mythology (1962) by Joseph Campbell is again one of those marathons of the mind. The knowledge that Campbell pours out is relentless for the entire 516 pages, but at the same time it is captivating to explore the development of ancient mythology and religion and civilization beginning with Central Asia (what is currently known as the Middle East), then to ancient India, then progressing to China and finally to Japan, ending briefly with Tibet. ”Man had been made not to be God but to know, honor, and serve him; so that even the king, who, according to the earlier mythological view, had been the chief embodiment of divinity on earth, was now but a priest offering sacrifice in tendance to One above–not a god returning himself in sacrifice to Himself” (p 7). In effect, the power structure of society is now changed. Priests are given the most high honor once held by kings, and this can still be found in monarchies where kings and queens in the social hierarchy are below the Church. Basic religion, at its earliest stages, has started to shape social belief structures. ”And the goal of knowledge cannot be to see God here and now in all things; for God is not in things. God is transcendent. God is beheld only by the dead. The goal of knowledge has to be, rather, to know the relationship of God to his creation, or, more specifically, to man, and through such knowledge, by God’s grace, to link one’s own will back to that of the Creator” (p 11). Only eleven pages in and we are beginning to see massive shifts in belief systems held for hundreds of years, and these shifts, or man’s attempt to define and explore God’s relationship to humanity will later help inspire the creation of most religions still found today (i.e., Jainism, Zoroastrianism, Buddhism, Christianity and Taoism). One of the reasons for this new attempt to define or understand God is humanity’s conception and naming of the Ego, which is still often discussed and debated in professional circles of education and philosophy. ”As long as an illusion of ego remains,” Campbell explains, ”the commensurate illusion of a separate deity also will be there; and vice versa, as long as the idea of a separate deity is cherished, an illusion of ego, related to it in love, fear, worship, exile, or atonement, will also be there” (p 14). Humanity, under Indian doctrine of that time period, defined the Four Ends as:  love and pleasure (kāma);  power and success (artha);  lawful order and moral virtue (dharma); and,  release from delusion (moksa); (I am currently going through a ”release of delusion” in regards to modern civilization’s absurd social structures and I believe number three is there to prevent number four from ever happening–which we will see later with China’s horrific reaction to Tibet’s religious order) (p 21). Now, as the infant grows into a child, decisions must be made. Humanity is now entering into the state of childhood. The child must no longer focus on ”I want” but must seek a greater understanding of self in his-her role in the family’s hierarchal structure and later in the classroom’s hierarchal structure. Remember, the role of godhood, priesthood and kinghood have all been established (especially in ancient Sumer and Egypt), but the role of Self is only now beginning to form. ”It is normally expected that an educated ego should have developed away from the simple infantile polarity of the pleasure and obedience principles toward a personal, uncompulsive, sensitive relationship to empirical reality, a certain adventurous attitude toward the unpredictable, and a sense of personal responsibility for decisions,” writes Campbell. ”Not life as a good soldier, but life as a developed, unique individual, is the ideal. And we shall search the Orient in vain for anything quite comparable. There the ideal, on the contrary, is the quenching, not development of the ego” (p 22). What comes next might amaze you. The most developed minds begin to see ancient stories and myths of gods and divinity as nothing more than stories created by artists. The ego has died and the wild fantasy of childish eyes beside the campfire and all listening to gods battling demons in the thunderous skies become less than what we might think of as religion and more of creative understanding over one’s creation, which some might argue is the next stage of a child’s development. F.M. Concord explains, ”Greek theology was not formulated by priests nor even by prophets, but by artists, poets and philosophers… The mythology, consequently, remains fluid, as poetry; and the gods are not literally concretized, like Yahweh in the garden, but are known to be just what they are: personifications brought into being by the human creative imagination” (p 30-31). ”These are the two discordant great themes,” explains Campbell, ”of what may be termed the orthodox Occidental mythological structure: poles of experience of an ego set apart from nature, maturing values of its own, which are not those of the given world, yet still projecting on the universe a notion of anthropomorphic fatherhood–as though it should ever have possessed, or might ever come to possess, either in itself or in its metaphysical ground, the values, sensibilities and intelligence, decency and nobility of a man” (p 32)! I will not go in great detail with the rest of the book but one can gain a glimpse of Campbell’s scope presented in the above section pertaining to his first chapter. As Campbell starts to shape the early history of the world one sees how humanity and structured religion and civilization has not been around for very long. In much respect, after reading Campbell’s accounts of ancient civilizations, I do not count the Sumerian and Egyptian efforts in language, religion and social orders as the age of humanity’s formation of a mature civilization, but instead it is more an infantile conception of things to come. For one thing, despite originating around 3500-3100 B.C., Sumer and Egypt remained in the youthful Bronze Age (roughly 3200 – 2200 B.C. ), toying with the invention of the wheel (c. 3500 B.C.) and the mature Iron Age (approx. 1200 B.C. – 400 A.D.) still had not come, and would slowly filter out and reach Japan very late in the game. Meanwhile, the perfection of weaponry and the wheel into a common form of transport, later developing into the emergence of the horse-drawn chariots, sword, and compound bow for war, would not be established until roughly c. 2000-1600 B.C., almost 1500 years after the wheel was invented. The reason the wheel is of vital importance is because it is then and only then we begin to see true, mature civilizations seeking to stretch its arms and legs through formalized religion, trade and war across Central Asia, Europe and India. Predynastic Periods, c. 2900 B.C. Old Kingdom Egypt, c. 2850-2190 B.C. Middle Kingdom Egypt, c. 2052-1610 B.C. The Nile for much of its Egyptian rule was a well-protected valley that cut off Egyptian society from outsiders and invaders and allowed dynasties to stay in power; the Hyksos, ”a mixed horde of Asiatic aliens,” however, invaded the northeast frontier in c. 1670-1570 B.C. through the assistance of war chariots and compound bows and these men ruled without Re and lived without divine command as the Egyptians once lived (p 103). The Egyptians, like the Sumerians, are now exposed to the outside world, much like infants stepping out the front door of their home for the first time, and we begin to see the fall of these two great empires. Mature civilizations? Not in the least. ”We see the first signs of the new force in the sudden appearance, shortly following c. 2000 B.C., of the light two-wheeled chariot drawn by a pair of well-trained steeds. The wheel, as we know, had already appeared in Sumer c. 3200 B.C., and…At some point in place and time, however, roughly c. 2000 B.C. And probably north of the Caucasus range, the light two-wheeled chariot drawn by two swift horses came into use, and the wheels, which now were spoked, revolved freely on their axles, so that the cars could be readily turned…Furthermore, in Southeastern Europe, c. 1500 B.C., a new weapon, the sword, appeared, contrived for slashing from the saddle. From somewhere men were coming who had learned to ride” (p 172-173). And Rome would later follow across the lands. What comes next is not at all surprising. Humanity is maturing as it looks upon the power that is brought with the creation of the wheel and so forms religions out of this idea known as a ”wheel.” The son of a king comes along and becomes the first Buddha around 563-483 B.C., and other such sages begin teaching about what awaits in death (here we may further note the maturing thought found in humanity). Such teachings later branch off into sects. One such belief is ”the idea of the wheel of rebirth” and the ”First Turning of the Wheel of the Law” (p 250, 281). In addition, the origins of Zoroastrians can be placed between c. 1200 and c. 500 B.C., and distinguish the world into good and evil (please note the similar time frame correlating to the advancement of the wheel and the sword). Zoroaster from Persia, explains Campbell, should be seen more as a symbol of tradition, like Homer, rather than one man (and some might argue the same to William Shakespeare) and the Zoroastrians believed ”the world, consequently, is a compound wherein good and evil, light and dark, wisdom and violence, are contending for victory. And the privilege and duty of each man–who, himself, as part of creation, is a compound of good and evil–is to elect, voluntarily, to engage in battle in the interest of the light” (p 7). However it would be the Jains that form its ”religion without God” (p 231) and establish two roads of afterlife, which other religions also share. The Jains believed in the Road of Flame that was a path to heaven and to the gods in the sun and this road was for those who were in essence righteous (p 234). The Road of Smoke (p 218) is a path to the moon, to the ancestors, and to a new life back on earth. The approach to afterlife is to accomplish enough good deeds in hopes of being worthy to ascend the higher road and the goal is to not be born again on earth, but to take one’s seat in the house of the gods. Many religions share this view of paradise. Winding down, there does seem to be a common agreement in the scattered histories of a ”mythic flood.” A flood that encompassed the entire planet at the same time seems to be highly unlikely, however, and instead explained and interpreted ”as a local, not as a general Mesopotamian (let alone universal) catastrophe. It is of course possible that in each little city state itself the local flood was overinterpreted as a cosmic event, rendering present the mythological Deluge” (p 121-122). 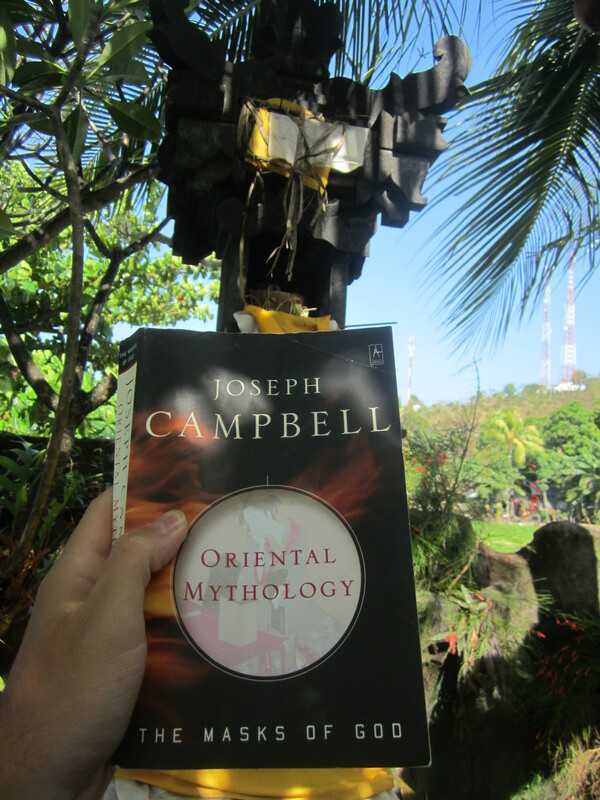 Campbell goes on to discuss in-depth about Buddhist India, the Indian Golden Age, Chinese Mythology, Japanese Mythology, and ends with a short chapter about Tibet’s period of suffering at the hands of China. It is with great satisfaction, therefore, that I strongly recommend this book for those serious scholars and other curious minds out there who take great interest in the history of the world. Excelsior! Now on to Book Three: The Masks of God, Vol. III: Occidental Mythology. I appreciate the kind words. All if for those who love books and love sharing ideas. Keep reading and enjoy!